Magnetic resonance imaging (MRI) is a medical imaging technique used in radiology to form pictures of the anatomy and the physiological processes of the body in both health and disease. MRI scanners use strong magnetic fields, magnetic field gradients, and radio waves to generate images of the organs in the body. MRI does not involve X-rays or the use of ionizing radiation, which distinguishes it from CT or CAT scans and PET scans. Magnetic resonance imaging is a medical applicationof nuclear magnetic resonance (NMR). NMR can also be used for imaging in other NMR applications such as NMR spectroscopy. While the hazards of X-rays are now well-controlled in most medical contexts, an MRI scan may still be seen as a better choice than a CT scan. MRI is widely used in hospitals and clinics for medical diagnosis, staging of disease and follow-up without exposing the body to radiation. An MRI may yield different information compared with CT. There may be risks and discomfort associated with MRI scans. Compared with CT scans, MRI scans typically take longer and are louder, and they usually need the subject to enter a narrow, confining tube. In addition, people with some medical implants or other non-removable metal inside the body may be unable to undergo an MRI examination safely. MRI was originally called NMRI (nuclear magnetic resonance imaging), but the use of ‘nuclear’ in the acronym was dropped to avoid negative associations with the word. Certain atomic nuclei are able to absorb and emit radio frequency energy when placed in an external magnetic field. In clinical and research MRI, hydrogen atoms are most often used to generate a detectable radio-frequency signal that is received by antennas in close proximity to the anatomy being examined. Hydrogen atoms are naturally abundant in people and other biological organisms, particularly in water and fat. For this reason, most MRI scans essentially map the location of water and fat in the body. Pulses of radio waves excite the nuclear spin energy transition, and magnetic field gradients localize the signal in space. By varying the parameters of the pulse sequence, different contrasts may be generated between tissues based on the relaxation properties of the hydrogen atoms therein. To perform a study, the person is positioned within an MRI scanner that forms a strong magnetic field around the area to be imaged. In most medical applications, protons (hydrogen atoms) in tissues containing water molecules create a signal that is processed to form an image of the body. First, energy from an oscillatingmagnetic field temporarily is applied to the patient at the appropriate resonance frequency. The excitedhydrogen atoms emit a radio frequency signal, which is measured by a receiving coil. The radio signal may be made to encode position information by varying the main magnetic field using gradient coils. As these coils are rapidly switched on and off they create the characteristic repetitive noise of an MRI scan. The contrast between different tissues is determined by the rate at which excited atoms return to the equilibrium state. Exogenouscontrast agents may be given to the person to make the image clearer. The major components of an MRI scanner are the main magnet, which polarizes the sample, the shim coils for correcting shifts in the homogeneity of the main magnetic field, the gradient system which is used to localize the MR signal and the RF system, which excites the sample and detects the resulting NMR signal. The whole system is controlled by one or more computers. MRI requires a magnetic field that is both strong and uniform. The field strength of the magnet is measured in teslas – and while the majority of systems operate at 1.5 T, commercial systems are available between 0.2 and 7 T. Most clinical magnets are superconducting magnets, which require liquid helium. Lower field strengths can be achieved with permanent magnets, which are often used in “open” MRI scanners for claustrophobicpatients. Recently, MRI has been demonstrated also at ultra-low fields, i.e., in the microtesla-to-millitesla range, where sufficient signal quality is made possible by prepolarization (on the order of 10-100 mT) and by measuring the Larmor precession fields at about 100 microtesla with highly sensitive superconducting quantum interference devices (SQUIDs). 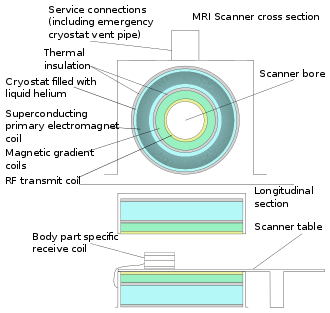 Each tissue returns to its equilibrium state after excitation by the independent relaxation processes of T1 (spin-lattice; that is, magnetization in the same direction as the static magnetic field) and T2 (spin-spin; transverse to the static magnetic field). To create a T1-weighted image, magnetization is allowed to recover before measuring the MR signal by changing the repetition time(TR). This image weighting is useful for assessing the cerebral cortex, identifying fatty tissue, characterizing focal liver lesions and in general for obtaining morphological information, as well as for post-contrast imaging. To create a T2-weighted image, magnetization is allowed to decay before measuring the MR signal by changing the echo time (TE). 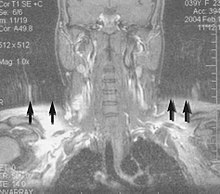 This image weighting is useful for detecting edema and inflammation, revealing white matter lesions and assessing zonal anatomy in the prostate and uterus. MRI is the investigation of choice in the preoperative staging of rectal and prostate cancer and, has a role in the diagnosis, staging, and follow-up of other tumors. MRI is the investigative tool of choice for neurological cancers, as it has better resolution than CT and offers better visualization of the posterior cranial fossa, containing the brainstem and the cerebellum. The contrast provided between grey and white mattermakes MRI the best choice for many conditions of the central nervous system, including demyelinating diseases, dementia, cerebrovascular disease, infectious diseases, Alzheimer’s disease and epilepsy. Since many images are taken milliseconds apart, it shows how the brain responds to different stimuli, enabling researchers to study both the functional and structural brain abnormalities in psychological disorders. MRI also is used in guided stereotactic surgery and radiosurgery for treatment of intracranial tumors, arteriovenous malformations, and other surgically treatable conditions using a device known as the N-localizer. Cardiac MRI is complementary to other imaging techniques, such as echocardiography, cardiac CT, and nuclear medicine. Its applications include assessment of myocardial ischemia and viability, cardiomyopathies, myocarditis, iron overload, vascular diseases, and congenital heart disease. Applications in the musculoskeletal system include spinal imaging, assessment of joint disease, and soft tissue tumors. Hepatobiliary MR is used to detect and characterize lesions of the liver, pancreas, and bile ducts. Focal or diffuse disorders of the liver may be evaluated using diffusion-weighted, opposed-phase imaging, and dynamic contrast enhancement sequences. Extracellular contrast agents are used widely in liver MRI and newer hepatobiliary contrast agents also provide the opportunity to perform functional biliary imaging. Anatomical imaging of the bile ducts is achieved by using a heavily T2-weighted sequence in magnetic resonance cholangiopancreatography (MRCP). Functional imaging of the pancreas is performed following administration of secretin. MR enterography provides non-invasive assessment of inflammatory bowel disease and small bowel tumors. MR-colonography may play a role in the detection of large polyps in patients at increased risk of colorectal cancer. Magnetic resonance angiography (MRA) generates pictures of the arteries to evaluate them for stenosis (abnormal narrowing) or aneurysms (vessel wall dilatations, at risk of rupture). MRA is often used to evaluate the arteries of the neck and brain, the thoracic and abdominal aorta, the renal arteries, and the legs (called a “run-off”). A variety of techniques can be used to generate the pictures, such as administration of a paramagnetic contrast agent (gadolinium) or using a technique known as “flow-related enhancement” (e.g., 2D and 3D time-of-flight sequences), where most of the signal on an image is due to blood that recently moved into that plane (see also FLASH MRI). Techniques involving phase accumulation (known as phase contrast angiography) can also be used to generate flow velocity maps easily and accurately. Magnetic resonance venography (MRV) is a similar procedure that is used to image veins. In this method, the tissue is now excited inferiorly, while the signal is gathered in the plane immediately superior to the excitation plane—thus imaging the venous blood that recently moved from the excited plane. 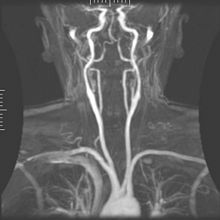 MRI for imaging anatomical structures or blood flow do not require contrast agents as the varying properties of the tissues or blood provide natural contrasts. However, for more specific types of imaging, exogenous contrast agents may be given intravenously, orally, or intra-articularly. The most commonly used intravenous contrast agents are based on chelates of gadolinium. In general, these agents have proved safer than the iodinated contrast agents used in X-ray radiography or CT. Anaphylactoid reactions are rare, occurring in approx. 0.03–0.1%. Of particular interest is the lower incidence of nephrotoxicity, compared with iodinated agents, when given at usual doses—this has made contrast-enhanced MRI scanning an option for patients with renal impairment, who would otherwise not be able to undergo contrast-enhanced CT. Although gadolinium agents have proved useful for patients with renal impairment, in patients with severe renal failure requiring dialysis there is a risk of a rare but serious illness, nephrogenic systemic fibrosis, which may be linked to the use of certain gadolinium-containing agents. The most frequently linked is gadodiamide, but other agents have been linked too. Although a causal link has not been definitively established, current guidelines in the United States are that dialysis patients should only receive gadolinium agents where essential, and that dialysis should be performed as soon as possible after the scan to remove the agent from the body promptly. In Europe, where more gadolinium-containing agents are available, a classification of agents according to potential risks has been released. Recently, a new contrast agent named gadoxetate, brand name Eovist (US) or Primovist (EU), was approved for diagnostic use: this has the theoretical benefit of a dual excretion path. An MRI sequence is a particular setting of radiofrequency pulses and gradients, resulting in a particular image appearance. The T1 and T2 weighting can also be described as MRI sequences. This table does not include uncommon and experimental sequences. Proton density weighted PD Long TR (to reduce T1) and short TE (to minimize T2) Joint disease and injury. Gradient echo(GRE) Steady-state free precession SSFP Maintenance of a steady, residual transverse magnetisation over successive cycles. Creation of cardiac MRI videos (pictured). or “T2-star” T2* Postexcitation refocused GRE with small flip angle. Low signal from hemosiderin deposits (pictured) and hemorrhages. Fluid-attenuated inversion recovery FLAIR Fluid suppression by setting an inversion time that nulls fluids High signal in lacunar infarction, multiple sclerosis (MS) plaques, subarachnoid haemorrhage and meningitis (pictured). Diffusion weighted(DWI) Conventional DWI Measure of Brownian motion of water molecules High signal within minutes of cerebral infarction (pictured). Perfusion weighted(PWI) Dynamic susceptibility contrast DSC Gadolinium contrast is injected, and rapid repeated imaging (generally gradient-echo echo-planar T2 weighted) quantifies susceptibility-induced signal loss In cerebral infarction, the infarcted core and the penumbra have decreased perfusion (pictured). Arterial spin labelling ASL Magnetic labeling of arterial blood below the imaging slab, which subsequently enters the region of interestIt does not need gadolinium contrast. Magnetic resonance spectroscopy (MRS) is used to measure the levels of different metabolites in body tissues. The MR signal produces a spectrum of resonances that corresponds to different molecular arrangements of the isotope being “excited”. This signature is used to diagnose certain metabolic disorders, especially those affecting the brain, and to provide information on tumor metabolism. Magnetic resonance spectroscopic imaging (MRSI) combines both spectroscopic and imaging methods to produce spatially localized spectra from within the sample or patient. The spatial resolution is much lower (limited by the available SNR), but the spectra in each voxel contains information about many metabolites. Because the available signal is used to encode spatial and spectral information, MRSI requires high SNR achievable only at higher field strengths (3 T and above). The high procurement and maintenance costs of MRI with extremely high field strengths inhibit their popularity. However, recent compressed sensing-based software algorithms (e.g., SAMV) have been proposed to achieve super-resolution without requiring such high field strengths. 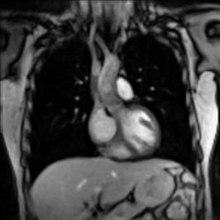 Real-time MRI refers to the continuous imaging of moving objects (such as the heart) in real time. One of the many different strategies developed since the early 2000s is based on radial FLASH MRI, and iterative reconstruction. This gives a temporal resolution of 20–30 ms for images with an in-plane resolution of 1.5–2.0 mm. Balanced steady-state free precession (bSSFP) imaging has a better image contrast between the blood pool and myocardium than the FLASH MRI, yet it will produce severe banding artifact when the B0 inhomogeneity is strong. Real-time MRI is likely to add important information on diseases of the heart and the joints, and in many cases may make MRI examinations easier and more comfortable for patients, especially for the patients who cannot hold their breathings or who have arrhythmia. The lack of harmful effects on the patient and the operator make MRI well-suited for interventional radiology, where the images produced by an MRI scanner guide minimally invasive procedures. Such procedures use no ferromagneticinstruments. A specialized growing subset of interventional MRI is intraoperative MRI, in which an MRI is used in surgery. Some specialized MRI systems allow imaging concurrent with the surgical procedure. More typically, the surgical procedure is temporarily interrupted so that MRI can assess the success of the procedure or guide subsequent surgical work. In guided therapy, high-intensity focused ultrasound (HIFU) beams are focused on a tissue, that are controlled using MR thermal imaging. Due to the high energy at the focus, the temperature rises to above 65 °C (150 °F) which completely destroys the tissue. This technology can achieve precise ablation of diseased tissue. MR imaging provides a three-dimensional view of the target tissue, allowing for the precise focusing of ultrasound energy. The MR imaging provides quantitative, real-time, thermal images of the treated area. This allows the physician to ensure that the temperature generated during each cycle of ultrasound energy is sufficient to cause thermal ablation within the desired tissue and if not, to adapt the parameters to ensure effective treatment. Hydrogen has the most frequently imaged nucleus in MRI because it is present in biological tissues in great abundance, and because its high gyromagnetic ratio gives a strong signal. However, any nucleus with a net nuclear spin could potentially be imaged with MRI. Such nuclei include helium-3, lithium-7, carbon-13, fluorine-19, oxygen-17, sodium-23, phosphorus-31 and xenon-129. 23Na and 31P are naturally abundant in the body, so can be imaged directly. Gaseous isotopes such as 3He or 129Xe must be hyperpolarized and then inhaled as their nuclear density is too low to yield a useful signal under normal conditions. 17O and 19F can be administered in sufficient quantities in liquid form (e.g. 17O-water) that hyperpolarization is not a necessity. Using helium or xenon has the advantage of reduced background noise, and therefore increased contrast for the image itself, because these elements are not normally present in biological tissues. Moreover, the nucleus of any atom that has a net nuclear spin and that is bonded to a hydrogen atom could potentially be imaged via heteronuclear magnetization transfer MRI that would image the high-gyromagnetic-ratio hydrogen nucleus instead of the low-gyromagnetic-ratio nucleus that is bonded to the hydrogen atom. In principle, hetereonuclear magnetization transfer MRI could be used to detect the presence or absence of specific chemical bonds. Multinuclear imaging is primarily a research technique at present. However, potential applications include functional imaging and imaging of organs poorly seen on 1H MRI (e.g., lungs and bones) or as alternative contrast agents. Inhaled hyperpolarized 3He can be used to image the distribution of air spaces within the lungs. Injectable solutions containing 13C or stabilized bubbles of hyperpolarized 129Xe have been studied as contrast agents for angiography and perfusion imaging. 31P can potentially provide information on bone density and structure, as well as functional imaging of the brain. Multinuclear imaging holds the potential to chart the distribution of lithium in the human brain, this element finding use as an important drug for those with conditions such as bipolar disorder. MRI has the advantages of having very high spatial resolution and is very adept at morphological imaging and functional imaging. MRI does have several disadvantages though. First, MRI has a sensitivity of around 10−3 mol/L to 10−5 mol/L, which, compared to other types of imaging, can be very limiting. This problem stems from the fact that the population difference between the nuclear spin states is very small at room temperature. For example, at 1.5 teslas, a typical field strength for clinical MRI, the difference between high and low energy states is approximately 9 molecules per 2 million. Improvements to increase MR sensitivity include increasing magnetic field strength, and hyperpolarization via optical pumping or dynamic nuclear polarization. There are also a variety of signal amplification schemes based on chemical exchange that increase sensitivity. To achieve molecular imaging of disease biomarkers using MRI, targeted MRI contrast agents with high specificity and high relaxivity (sensitivity) are required. To date, many studies have been devoted to developing targeted-MRI contrast agents to achieve molecular imaging by MRI. Commonly, peptides, antibodies, or small ligands, and small protein domains, such as HER-2 affibodies, have been applied to achieve targeting. To enhance the sensitivity of the contrast agents, these targeting moieties are usually linked to high payload MRI contrast agents or MRI contrast agents with high relaxivities. A new class of gene targeting MR contrast agents (CA) has been introduced to show gene action of unique mRNA and gene transcription factor proteins. This new CA can trace cells with unique mRNA, microRNA and virus; tissue response to inflammation in living brains. The MR reports change in gene expression with positive correlation to TaqMan analysis, optical and electron microscopy. In the UK, the price of a clinical 1.5-tesla MRI scanner is around £920,000/US$1.4 million, with the lifetime maintenance cost broadly similar to the purchase cost. In the Netherlands, the average MRI scanner costs around €1 million, with a 7-T MRI having been taken in use by the UMC Utrecht in December 2007, costing €7 million.Construction of MRI suites could cost up to US$500,000/€370.000 or more, depending on project scope. Pre-polarizing MRI (PMRI) systems using resistive electromagnets have shown promise as a low-cost alternative and have specific advantages for joint imaging near metal implants; however, they are likely unsuitable for routine whole-body or neuroimaging applications. MRI scanners have become significant sources of revenue for healthcare providers in the US. This is because of favorable reimbursement rates from insurers and federal government programs. Insurance reimbursement is provided in two components, an equipment charge for the actual performance and operation of the MRI scan and a professional charge for the radiologist’s review of the images and/or data. In the US Northeast, an equipment charge might be $3,500/€2,600 and a professional charge might be $350/€260, although the actual fees received by the equipment owner and interpreting physician are often significantly less and depend on the rates negotiated with insurance companies or determined by the Medicare fee schedule. For example, an orthopedic surgery group in Illinois billed a charge of $1,116/€825 for a knee MRI in 2007, but the Medicare reimbursement in 2007 was only $470.91/€350. Many insurance companies require advance approval of an MRI procedure as a condition for coverage. In the US, the Deficit Reduction Act of 2005 significantly reduced reimbursement rates paid by federal insurance programs for the equipment component of many scans, shifting the economic landscape. Many private insurers have followed suit. In the United States, an MRI of the brain with and without contrast billed to Medicare Part B entails, on average, a technical payment of US$403/€300 and a separate payment to the radiologist of US$93/€70. In France, the cost of an MRI exam is approximately €150/US$205. This covers three basic scans including one with an intravenous contrast agent as well as a consultation with the technician and a written report to the patient’s physician. In Japan, the cost of an MRI examination (excluding the cost of contrast material and films) ranges from US$155/€115 to US$180/€133, with an additional radiologist professional fee of US$17/€12.50. In India, the cost of an MRI examination including the fee for the radiologist’s opinion comes to around Rs 3000–4000 (€37–49/US$50–60), excluding the cost of contrast material. In the UK the retail price for an MRI scan privately ranges between £350 and £700 (€405–810). MRI is in general a safe technique, although injuries may occur as a result of failed safety procedures or human error. Contraindications to MRI include most cochlear implants and cardiac pacemakers, shrapnel, and metallic foreign bodies in the eyes. The safety of MRI during the first trimester of pregnancy is uncertain, but it may be preferable to other options. Since MRI does not use any ionizing radiation, its use is generally favored in preference to CT when either modality could yield the same information. In certain cases, MRI is not preferred as it may be more expensive, time-consuming, and claustrophobia-exacerbating. MRI uses powerful magnets and can therefore cause magnetic materials to move at great speeds posing risk. Deaths have occurred. However, as millions of MRIs are performed globally each year, fatalities are extremely rare. Medical societies issue guidelines for when physicians should use MRI on patients and recommend against overuse. MRI can detect health problems or confirm a diagnosis, but medical societies often recommend that MRI not be the first procedure for creating a plan to diagnose or manage a patient’s complaint. A common case is to use MRI to seek a cause of low back pain; the American College of Physicians, for example, recommends against this procedure as unlikely to result in a positive outcome for the patient. An MRI artifact is a visual artifact, that is, an anomaly during visual representation. Many different artifacts can occur during magnetic resonance imaging (MRI), some affecting the diagnostic quality, while others may be confused with pathology. Artifacts can be classified as patient-related, signal processing-dependent and hardware (machine)-related. MRI is used industrially mainly for routine analysis of chemicals. The nuclear magnetic resonance technique is also used, for example, to measure the ratio between water and fat in foods, monitoring of flow of corrosive fluids in pipes, or to study molecular structures such as catalysts. In 1971, Paul Lauterbur applied magnetic field gradients in all three dimensions and a back-projection technique to create NMR images. He published the first images of two tubes of water in 1973 in the journal Nature, followed by the picture of a living animal, a clam, and in 1974 by the image of the thoracic cavity of a mouse. Lauterbur called his imaging method zeugmatography, a term which was later replaced by (N)MR imaging. In the late 1970s, physicists Peter Mansfield and Paul Lauterbur, developed MRI-related techniques, like the echo-planar imaging (EPI) technique. Mansfield and Lauterbur were awarded the 2003 Nobel Prize in Physiology or Medicine for their “discoveries concerning magnetic resonance imaging”. ^ McRobbie DW, Moore EA, Graves MJ, Prince MR (2007). MRI from Picture to Proton. Cambridge University Press. p. 1. ISBN 978-1-139-45719-4. ^ Smith-Bindman R, Miglioretti DL, Johnson E, Lee C, Feigelson HS, Flynn M, et al. (June 2012). “Use of diagnostic imaging studies and associated radiation exposure for patients enrolled in large integrated health care systems, 1996-2010″. JAMA. 307 (22): 2400–9. doi:10.1001/jama.2012.5960. PMC 3859870. PMID 22692172. ^ Health at a glance 2009 OECD indicators. Health at a Glance. 2009. doi:10.1787/health_glance-2009-en. ISBN 978-92-64-07555-9. ^ Jump up to: a b McRobbie DW (2007). MRI from picture to proton. Cambridge, UK; New York: Cambridge University Press. ISBN 978-0-521-68384-5. ^ Sasaki M, Ehara S, Nakasato T, Tamakawa Y, Kuboya Y, Sugisawa M, Sato T (April 1990). “MR of the shoulder with a 0.2-T permanent-magnet unit”. AJR. American Journal of Roentgenology. 154 (4): 777–8. doi:10.2214/ajr.154.4.2107675. PMID 2107675. ^ McDermott R, Lee S, ten Haken B, Trabesinger AH, Pines A, Clarke J (May 2004). “Microtesla MRI with a superconducting quantum interference device”. Proceedings of the National Academy of Sciences of the United States of America. 101 (21): 7857–61. doi:10.1073/pnas.0402382101. PMC 419521. PMID 15141077. ^ Zotev VS, Matlashov AN, Volegov PL, Urbaitis AV, Espy MA, Kraus Jr RH (2007). “SQUID-based instrumentation for ultralow-field MRI”. Superconductor Science and Technology. 20 (11): S367–S373. arXiv:0705.0661. doi:10.1088/0953-2048/20/11/S13. ^ Vesanen PT, Nieminen JO, Zevenhoven KC, Dabek J, Parkkonen LT, Zhdanov AV, Luomahaara J, Hassel J, Penttilä J, Simola J, Ahonen AI, Mäkelä JP, Ilmoniemi RJ (June 2013). “Hybrid ultra-low-field MRI and magnetoencephalography system based on a commercial whole-head neuromagnetometer”. Magnetic Resonance in Medicine. 69 (6): 1795–804. doi:10.1002/mrm.24413. PMID 22807201. ^ Jump up to: a b c d e f g h “Magnetic Resonance Imaging”. University of Wisconsin. Archived from the original on 2017-05-10. Retrieved 2016-03-14. ^ Jump up to: a b Tushar Patil (2013-01-18). “MRI sequences”. Retrieved 2016-03-14. ^ “Magnetic Resonance, a critical peer-reviewed introduction”. European Magnetic Resonance Forum. Retrieved 17 November 2014. ^ Hollingworth W, Todd CJ, Bell MI, Arafat Q, Girling S, Karia KR, Dixon AK (November 2000). “The diagnostic and therapeutic impact of MRI: an observational multi-centre study”. Clinical Radiology. 55 (11): 825–31. doi:10.1053/crad.2000.0546. PMID 11069736. ^ Husband J (2008). Recommendations for Cross-Sectional Imaging in Cancer Management: Computed Tomography – CT Magnetic Resonance Imaging – MRI Positron Emission Tomography – PET-CT (PDF). Royal College of Radiologists. ISBN 978-1-905034-13-0. ^ American Society of Neuroradiology (2013). “ACR-ASNR Practice Guideline for the Performance and Interpretation of Magnetic Resonance Imaging (MRI) of the Brain” (PDF). ^ Rowayda AS (May 2012). “An improved MRI segmentation for atrophy assessment”. International Journal of Computer Science Issues (IJCSI). 9 (3). ^ Rowayda AS (February 2013). “Regional atrophy analysis of MRI for early detection of alzheimer’s disease”. International Journal of Signal Processing, Image Processing and Pattern Recognition. 6 (1): 49–53. ^ Nolen-Hoeksema S (2014). Abnormal Psychology (Sixth ed.). New York: McGraw-Hill Education. p. 67. ^ Brown RA, Nelson JA (June 2016). “The Invention and Early History of the N-Localizer for Stereotactic Neurosurgery”. Cureus. 8 (6): e642. doi:10.7759/cureus.642. PMC 4959822. PMID 27462476. ^ Leksell L, Leksell D, Schwebel J (January 1985). “Stereotaxis and nuclear magnetic resonance”. Journal of Neurology, Neurosurgery, and Psychiatry. 48(1): 14–8. doi:10.1136/jnnp.48.1.14. PMC 1028176. PMID 3882889. ^ Heilbrun MP, Sunderland PM, McDonald PR, Wells TH, Cosman E, Ganz E (1987). “Brown-Roberts-Wells stereotactic frame modifications to accomplish magnetic resonance imaging guidance in three planes”. Applied Neurophysiology. 50 (1–6): 143–52. doi:10.1159/000100700. PMID 3329837. ^ Society of Cardiovascular Computed Tomography; Society for Cardiovascular Magnetic Resonance; American Society of Nuclear Cardiology; North American Society for Cardiac Imaging; Society for Cardiovascular Angiography Interventions; Society of Interventional Radiology (October 2006). “ACCF/ACR/SCCT/SCMR/ASNC/NASCI/SCAI/SIR 2006 appropriateness criteria for cardiac computed tomography and cardiac magnetic resonance imaging. A report of the American College of Cardiology Foundation Quality Strategic Directions Committee Appropriateness Criteria Working Group”. Journal of the American College of Radiology. 3 (10): 751–71. doi:10.1016/j.jacr.2006.08.008. PMID 17412166. ^ Helms C (2008). Musculoskeletal MRI. Saunders. ISBN 978-1-4160-5534-1. ^ Frydrychowicz A, Lubner MG, Brown JJ, Merkle EM, Nagle SK, Rofsky NM, Reeder SB (March 2012). “Hepatobiliary MR imaging with gadolinium-based contrast agents”. Journal of Magnetic Resonance Imaging. 35 (3): 492–511. doi:10.1002/jmri.22833. PMC 3281562. PMID 22334493. ^ Sandrasegaran K, Lin C, Akisik FM, Tann M (July 2010). “State-of-the-art pancreatic MRI”. AJR. American Journal of Roentgenology. 195 (1): 42–53. doi:10.2214/ajr.195.3_supplement.0s42. PMID 20566796. ^ Masselli G, Gualdi G (August 2012). “MR imaging of the small bowel”. Radiology. 264 (2): 333–48. doi:10.1148/radiol.12111658. PMID 22821694. ^ Zijta FM, Bipat S, Stoker J (May 2010). “Magnetic resonance (MR) colonography in the detection of colorectal lesions: a systematic review of prospective studies”. European Radiology. 20 (5): 1031–46. doi:10.1007/s00330-009-1663-4. PMC 2850516. PMID 19936754. ^ Rinck PA (2014). “Chapter 13: Contrast Agents”. Magnetic Resonance in Medicine. ^ Murphy KJ, Brunberg JA, Cohan RH (October 1996). “Adverse reactions to gadolinium contrast media: a review of 36 cases”. AJR. American Journal of Roentgenology. 167 (4): 847–9. doi:10.2214/ajr.167.4.8819369. PMID 8819369. ^ “ACR guideline”. guideline.gov. 2005. Archived from the original on 2006-09-29. Retrieved 2006-11-22. ^ Thomsen HS, Morcos SK, Dawson P (November 2006). “Is there a causal relation between the administration of gadolinium based contrast media and the development of nephrogenic systemic fibrosis (NSF)?”. Clinical Radiology. 61 (11): 905–6. doi:10.1016/j.crad.2006.09.003. PMID 17018301. ^ “FDA Drug Safety Communication: New warnings for using gadolinium-based contrast agents in patients with kidney dysfunction”. Information on Gadolinium-Based Contrast Agents. U.S. Food and Drug Administration. 23 December 2010. Retrieved 12 March 2011. ^ “FDA Public Health Advisory: Gadolinium-containing Contrast Agents for Magnetic Resonance Imaging”. fda.gov. Archived from the original on 2006-09-28. ^ “Gadolinium-containing contrast agents: new advice to minimise the risk of nephrogenic systemic fibrosis”. Drug Safety Update. 3 (6): 3. January 2010. ^ “MRI Questions and Answers” (PDF). Concord, CA: International Society for Magnetic Resonance in Medicine. Retrieved 2010-08-02. ^ “Response to the FDA’s May 23, 2007, Nephrogenic Systemic Fibrosis Update1 — Radiology”. Radiological Society of North America. 2007-09-12. Archived from the original on 2012-07-19. Retrieved 2010-08-02. ^ Jones J, Gaillard F. “MRI sequences (overview)”. Radiopaedia. Retrieved 2017-10-15. ^ Jump up to: a b c d “Magnetic Resonance Imaging”. University of Wisconsin. Archived from the original on 2017-05-10. Retrieved 2016-03-14. ^ Jump up to: a b c d Johnson KA. “Basic proton MR imaging. Tissue Signal Characteristics”. Harvard Medical School. Archived from the original on 2016-03-05. Retrieved 2016-03-14. ^ du Plessis V, Jones J. “MRI sequences (overview)”. Radiopaedia. Retrieved 2017-01-13. ^ Lefevre N, Naouri JF, Herman S, Gerometta A, Klouche S, Bohu Y (2016). “A Current Review of the Meniscus Imaging: Proposition of a Useful Tool for Its Radiologic Analysis”. Radiology Research and Practice. 2016: 8329296. doi:10.1155/2016/8329296. PMID 27057352. ^ Jump up to: a b Luijkx T, Weerakkody Y. “Steady-state free precession MRI”. Radiopaedia. Retrieved 2017-10-13. ^ Jump up to: a b Chavhan GB, Babyn PS, Thomas B, Shroff MM, Haacke EM (2009). “Principles, techniques, and applications of T2*-based MR imaging and its special applications”. Radiographics. 29 (5): 1433–49. doi:10.1148/rg.295095034. PMID 19755604. ^ Sharma R, Taghi Niknejad M. “Short tau inversion recovery”. Radiopaedia. Retrieved 2017-10-13. ^ Berger F, de Jonge M, Smithuis R, Maas M. “Stress fractures”. Radiology Assistant. Radiology Society of the Netherlands. Retrieved 2017-10-13. ^ Hacking C, Taghi Niknejad M, et al. “Fluid attenuation inversion recoveryg”. radiopaedia.org. Retrieved 2015-12-03. ^ Jump up to: a b Di Muzio B, Abd Rabou A. “Double inversion recovery sequence”. Radiopaedia. Retrieved 2017-10-13. ^ Lee M, Bashir U. “Diffusion weighted imaging”. Radiopaedia. Retrieved 2017-10-13. ^ Weerakkody Y, Gaillard F. “Ischaemic stroke”. Radiopaedia. Retrieved 2017-10-15. ^ Hammer M. “MRI Physics: Diffusion-Weighted Imaging”. XRayPhysics. Retrieved 2017-10-15. ^ An H, Ford AL, Vo K, Powers WJ, Lee JM, Lin W (May 2011). “Signal evolution and infarction risk for apparent diffusion coefficient lesions in acute ischemic stroke are both time- and perfusion-dependent”. Stroke. 42 (5): 1276–81. doi:10.1161/STROKEAHA.110.610501. PMID 21454821. ^ Jump up to: a b Smith D, Bashir U. 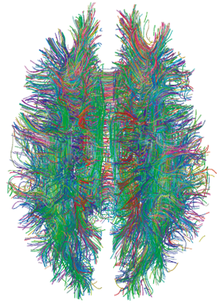 “Diffusion tensor imaging”. Radiopaedia. Retrieved 2017-10-13. ^ Chua TC, Wen W, Slavin MJ, Sachdev PS (February 2008). “Diffusion tensor imaging in mild cognitive impairment and Alzheimer’s disease: a review”. Current Opinion in Neurology. 21 (1): 83–92. doi:10.1097/WCO.0b013e3282f4594b. PMID 18180656. ^ Gaillard F. “Dynamic susceptibility contrast (DSC) MR perfusion”. Radiopaedia. Retrieved 2017-10-14. ^ Chen F, Ni YC (March 2012). “Magnetic resonance diffusion-perfusion mismatch in acute ischemic stroke: An update”. World Journal of Radiology. 4 (3): 63–74. doi:10.4329/wjr.v4.i3.63. PMID 22468186. ^ Gaillard F. “Dynamic contrast enhanced (DCE) MR perfusion”. Radiopaedia. Retrieved 2017-10-15. ^ “Arterial spin labeling”. University of Michigan. Retrieved 2017-10-27. ^ Gaillard F. “Arterial spin labelling (ASL) MR perfusion”. Radiopaedia. Retrieved 2017-10-15. ^ Chou I. “Milestone 19: (1990) Functional MRI”. Nature. Retrieved 9 August2013. ^ Luijkx T, Gaillard F. “Functional MRI”. Radiopaedia. Retrieved 2017-10-16. ^ Jump up to: a b “Magnetic Resonance Angiography (MRA)”. Johns Hopkins Hospital. Retrieved 2017-10-15. ^ Keshavamurthy J, Ballinger R et al. “Phase contrast imaging”. Radiopaedia. Retrieved 2017-10-15. ^ Di Muzio B, Gaillard F. “Susceptibility weighted imaging”. Retrieved 2017-10-15. ^ Rosen Y, Lenkinski RE (July 2007). “Recent advances in magnetic resonance neurospectroscopy”. Neurotherapeutics. 4 (3): 330–45. doi:10.1016/j.nurt.2007.04.009. PMID 17599700. ^ Golder W (June 2004). “Magnetic resonance spectroscopy in clinical oncology”. Onkologie. 27 (3): 304–9. doi:10.1159/000077983. PMID 15249722. ^ Chakeres DW, Abduljalil AM, Novak P, Novak V (2002). “Comparison of 1.5 and 8 tesla high-resolution magnetic resonance imaging of lacunar infarcts”. Journal of Computer Assisted Tomography. 26 (4): 628–32. doi:10.1097/00004728-200207000-00027. PMID 12218832. ^ “MRI-scanner van 7 miljoen in gebruik” [MRI scanner of €7 million in use] (in Dutch). Medisch Contact. December 5, 2007. ^ Abeida H, Zhang Q, Li J, Merabtine N (2013). “Iterative Sparse Asymptotic Minimum Variance Based Approaches for Array Processing”. IEEE Transactions on Signal Processing. 61 (4): 933–944. arXiv:1802.03070. doi:10.1109/tsp.2012.2231676. ^ Uecker M, Zhang S, Voit D, Karaus A, Merboldt KD, Frahm J (October 2010). “Real-time MRI at a resolution of 20 ms”. NMR in Biomedicine. 23 (8): 986–94. doi:10.1002/nbm.1585. PMID 20799371. ^ Uyanik I, Lindner P, Tsiamyrtzis P, Shah D, Tsekos NV, Pavlidis IT (2013). Functional Imaging and Modeling of the Heart. Lecture Notes in Computer Science. 7945. pp. 466–473. doi:10.1007/978-3-642-38899-6_55. ISBN 978-3-642-38898-9. ISSN 0302-9743. ^ Cline HE, Schenck JF, Hynynen K, Watkins RD, Souza SP, Jolesz FA (1992). “MR-guided focused ultrasound surgery”. Journal of Computer Assisted Tomography. 16 (6): 956–65. doi:10.1097/00004728-199211000-00024. PMID 1430448. ^ “Hyperpolarized Noble Gas MRI Laboratory: Hyperpolarized Xenon MR Imaging of the Brain”. Harvard Medical School. Retrieved 2017-07-26. ^ Hurd RE, John BK (1991). “Gradient-enhanced proton-detected heteronuclear multiple-quantum coherence spectroscopy”. Journal of Magnetic Resonance. 91(3): 648–653. doi:10.1016/0022-2364(91)90395-a. ^ Brown RA, Venters RA, Tang PP, Spicer LD (1995). “A Test for Scaler Coupling between Heteronuclei Using Gradient-Enhanced Proton-Detected HMQC Spectroscopy”. Journal of Magnetic Resonance, Series A. 113: 117–119. doi:10.1006/jmra.1995.1064. ^ Miller AF, Egan LA, Townsend CA (March 1997). “Measurement of the degree of coupled isotopic enrichment of different positions in an antibiotic peptide by NMR”. Journal of Magnetic Resonance. 125 (1): 120–31. doi:10.1006/jmre.1997.1107. PMID 9245367. ^ Xue S, Qiao J, Pu F, Cameron M, Yang JJ (2013). “Design of a novel class of protein-based magnetic resonance imaging contrast agents for the molecular imaging of cancer biomarkers”. Wiley Interdisciplinary Reviews: Nanomedicine and Nanobiotechnology. 5 (2): 163–79. doi:10.1002/wnan.1205. PMC 4011496. PMID 23335551. ^ Liu CH, Kim YR, Ren JQ, Eichler F, Rosen BR, Liu PK (January 2007). “Imaging cerebral gene transcripts in live animals”. The Journal of Neuroscience. 27 (3): 713–22. doi:10.1523/JNEUROSCI.4660-06.2007. PMC 2647966. PMID 17234603. ^ Liu CH, Ren J, Liu CM, Liu PK (January 2014). “Intracellular gene transcription factor protein-guided MRI by DNA aptamers in vivo”. FASEB Journal. 28 (1): 464–73. doi:10.1096/fj.13-234229. PMC 3868842. PMID 24115049. ^ Liu CH, You Z, Liu CM, Kim YR, Whalen MJ, Rosen BR, Liu PK (March 2009). “Diffusion-weighted magnetic resonance imaging reversal by gene knockdown of matrix metalloproteinase-9 activities in live animal brains”. The Journal of Neuroscience. 29 (11): 3508–17. doi:10.1523/JNEUROSCI.5332-08.2009. PMC 2726707. PMID 19295156. ^ Liu CH, Yang J, Ren JQ, Liu CM, You Z, Liu PK (February 2013). “MRI reveals differential effects of amphetamine exposure on neuroglia in vivo”. FASEB Journal. 27 (2): 712–24. doi:10.1096/fj.12-220061. PMC 3545538. PMID 23150521. ^ “Managing high value capital equipment in the NHS in England” (PDF). National Audit Office (United Kingdom). Archived from the original (PDF) on 3 December 2013. Retrieved 30 November 2013. ^ “MRI-scanner big financial success for Philips (Dutch)”. Eindhovens Dagblad (ED). Retrieved 18 February 2009. ^ “MRI scanner of €7 million in use(Dutch)”. Medisch Contact. Archived from the original on 4 September 2015. Retrieved 5 December 2007. ^ Morgan P, Conolly S, Scott G, Macovski A (October 1996). “A readout magnet for prepolarized MRI”. Magnetic Resonance in Medicine. 36 (4): 527–36. doi:10.1002/mrm.1910360405. PMID 8892203. ^ Blamire AM (August 2008). “The technology of MRI–the next 10 years?”. The British Journal of Radiology. 81 (968): 601–17. doi:10.1259/bjr/96872829. PMID 18628329. ^ Goldstein WM, Gordon AC, Branson JJ, Simmons C, Berland K, Willsey DS, Andrews AL (March 5–9, 2008). Over-Utilization of MRI in the Osteoarthritis Patient (PDF). Annual Meeting AAOS. San Francisco. Archived from the original (PDF) on 2015-09-04. Retrieved 2013-07-27. ^ Current Procedural Terminology code #70553 “2010 Medicare Part B National Summary Data File” Archived 2012-02-14 at the Wayback Machine. Data.gov, An Official Website of the United States Government. ^ “How long does an MRI take?”. WebMD.com. WebMD. ^ Ehara S, Nakajima Y, Matsui O (August 2008). “Radiology in Japan in 2008″. AJR. American Journal of Roentgenology. 191 (2): 328–9. doi:10.2214/AJR.07.3940. PMID 18647897. ^ “Private MRI Scan”. Fairfield.org.uk. Fairfield Independent Hospital. Retrieved 2017-03-28. ^ Watson RE (2015). “Lessons Learned from MRI Safety Events”. Current Radiology Reports. 3 (10). doi:10.1007/s40134-015-0122-z. ^ Wang PI, Chong ST, Kielar AZ, Kelly AM, Knoepp UD, Mazza MB, Goodsitt MM (April 2012). “Imaging of pregnant and lactating patients: part 1, evidence-based review and recommendations”. AJR. American Journal of Roentgenology. 198 (4): 778–84. doi:10.2214/AJR.11.7405. PMID 22451541. ^ “iRefer”. Royal College of Radiologists. Retrieved 10 November 2013. ^ Consumer Reports; American College of Physicians. presented by ABIM Foundation. “Five Things Physicians and Patients Should Question” (PDF). Choosing Wisely. Archived from the original (PDF) on June 24, 2012. Retrieved August 14, 2012. ^ Consumer Reports; American College of Physicians (April 2012). “Imaging tests for lower-back pain: Why you probably don’t need them” (PDF). High Value Care. Archived from the original (PDF) on 15 January 2013. Retrieved August 14, 2012. ^ Jump up to: a b Erasmus LJ, Hurter D, Naude M, Kritzinger HG, Acho S (2004). “A short overview of MRI artefacts”. South African Journal of Radiology. 8 (2): 13. doi:10.4102/sajr.v8i2.127. ^ Rinck PA (2017). “Chapter Nineteen Non-Medical Applications of NMR and MRI”. Magnetic Resonance (11th ed.). Retrieved 2017-12-18. ^ Rinck PA (2008). “A short history of magnetic resonance imaging”. Spectroscopy Europe. 20 (1): 7. ^ Mansfield P, Grannell PK (1975). ““Diffraction” and microscopy in solids and liquids by NMR”. Physical Review B. 12 (9): 3618–3634. doi:10.1103/physrevb.12.3618. Rinck PA (ed.). “The history of MRI”. TRTF/EMRF. Eustace SJ, Nelson E (June 2004). “Whole body magnetic resonance imaging”. BMJ. 328 (7453): 1387–8. doi:10.1136/bmj.328.7453.1387. PMC 421763. PMID 15191954. Pykett IL (May 1982). “NMR imaging in medicine”. Scientific American. 246 (5): 78–88. doi:10.1038/scientificamerican0582-78. PMID 7079720. Simon M, Mattson JS (1996). The pioneers of NMR and magnetic resonance in medicine: The story of MRI. Ramat Gan, Israel: Bar-Ilan University Press. ISBN 978-0-9619243-1-7. Haacke EM, Brown RF, Thompson M, Venkatesan R (1999). Magnetic resonance imaging: Physical principles and sequence design. New York: J. Wiley & Sons. ISBN 978-0-471-35128-3. Lee SC, Kim K, Kim J, Lee S, Han Yi J, Kim SW, Ha KS, Cheong C (June 2001). “One micrometer resolution NMR microscopy”. Journal of Magnetic Resonance. 150 (2): 207–13. doi:10.1006/jmre.2001.2319. PMID 11384182. Sprawls P (2000). Magnetic Resonance Imaging Principles, Methods, and Techniques. Medical Physics Publishing. ISBN 978-0-944838-97-6. Mansfield P (1982). NMR Imaging in Biomedicine: Supplement 2 Advances in Magnetic Resonance. Elsevier. ISBN 978-0-323-15406-2. Fukushima E (1989). NMR in Biomedicine: The Physical Basis. Springer Science & Business Media. ISBN 978-0-88318-609-1. Blümich B, Kuhn W (1992). Magnetic Resonance Microscopy: Methods and Applications in Materials Science, Agriculture and Biomedicine. Wiley. ISBN 978-3-527-28403-0. Blümer P (1998). Blümler P, Blümich B, Botto RE, Fukushima E, eds. Spatially Resolved Magnetic Resonance: Methods, Materials, Medicine, Biology, Rheology, Geology, Ecology, Hardware. Wiley-VCH. ISBN 978-3-527-29637-8. Liang Z, Lauterbur PC (1999). Principles of Magnetic Resonance Imaging: A Signal Processing Perspective. Wiley. ISBN 978-0-7803-4723-6. Schmitt F, Stehling MK, Turner R (1998). Echo-Planar Imaging: Theory, Technique and Application. Springer Berlin Heidelberg. ISBN 978-3-540-63194-1. Kuperman V (2000). Magnetic Resonance Imaging: Physical Principles and Applications. Academic Press. ISBN 978-0-08-053570-8. Blümich B (2000). NMR Imaging of Materials. Clarendon Press. ISBN 978-0-19-850683-6. Jin J (1998). Electromagnetic Analysis and Design in Magnetic Resonance Imaging. CRC Press. ISBN 978-0-8493-9693-9. Farhat IA, Belton PS, Webb GA (2007). Magnetic Resonance in Food Science: From Molecules to Man. Royal Society of Chemistry. ISBN 978-0-85404-340-8. Rinck PA (ed.). “MRI: A Peer-Reviewed, Critical Introduction”. European Magnetic Resonance Forum (EMRF)/The Round Table Foundation (TRTF).